Do I hear Ten Thousand? I write flash fiction, poetry, short stories and creative non-fiction, including interviews and essays. I've written extensively in the fields of entrepreneurship, women in the arts and event technology for publications such as Under30CEO.com and techsytalk.com, including over 40 profiles of innovative business leaders. My current passion project is a book of poetry, Mouth Manifesto, which embraces romantic love, self love, and personal identity. Several titles from that collection appear here at Fictionaut, including Want, Casual and Blue Moon. I received a Bachelor's Degree in Theater from Smith College, and I've studied writing with Jackson Taylor and Laurie Stone. I'm also a flutist and a DJ. I write because it's how I make sense of the world. I write for a living, and I write for passion and sometimes just for fun. Everything fuels my creativity, but most especially the intense passages of life. I channel all of my experience - the highs and lows - into my writing. I use writing as a tool of communication and connection. Thanks again, Deborah! Glad you liked "Another". And btw, I just came across your wonderful comment on The Boy Who Knew Death. Appreciate the read. Thanks. Scar is a fine, honest piece of writing. It was a pleasure to read and comment on it. A writer is always onto something good when he/she is telling the truth, and you did that rather btfly with your piece. Deborah, thank you reading my story and generously commenting about it. Deborah, thank you for your comments and fav on "Blood or Kisses" - it means a lot! Thanks, Deborah, for your kind comment on 'Invoking Fire'. Deborah, thanks for the kind comments on "Beware the Armed Man". Experiencing the teen stuff/high school was easy from the girl's perspective; it's the guy who took years to understand. thank you so much for your comments on my poem. Thanks for reading and commenting on "Whiplash Marriage," Deborah. I always enjoy and am cheered reading your comments. Thank you,Deborah, for your comment on "Never Let Me Go ". I'm thrilled you recognized the way I worked movements into it. Deborah, Thank you for your comment on my piece, and I see that you mention Stephen King's book on writing, which is also one of my favorites, though for some reason I haven't included it in my list of favorite books. And Paul Auster has an incredibly imaginative mind. Hi Deborah. re The Bookshelves. I really did relate. :) These mothers do their work so well they don't even need to be in the room. We do their criticising for them just by hearing their voice in our heads. Your comments about my poems are very kind. Thank you, Deborah, for liking "In My Nephritic Dreams," and "Annulling the Future." Thanks, Deborah, for commenting on "I Am Not a Corpse." Loved your comment. Thank you for your great comment on Our Travels on Fire. Thanks for your comment on 20th Century Anna, you always get what I'm trying to do, thank you!! Deborah, thank you for reading several of my stories. I appreciate your comments very much indeed. Thanks so much for commenting on "Anchored Leaves"! Thank you, Deborah, for your generous look at "Cairn". Dear Deb, thanks for your ongoing support of the Demons as it devilishly makes its way into the world. Deb, thanks as always for your comments, so much appreciated!! Deborah, thank you for your reading and remarks regarding "Metastasis". Re: Gassed . The organizations against nukes do parse it down to action steps, mostly emailing specific people on specific issues. Easy. I do it all the time but it doesn't feel like enough. Thanks for your long, thoughtful response. Thank you very much for feeling my story so well, Entangled. Thank you so very much for reading The Light at the End of You and your kind comments - much appreciated. Deb, thanks for your comments and your fav for Almost Like Love. Its a strange and wonderful process to revisit work from ten year ago, and I am heartened by your support! Glad you enjoyed ODD in the holiday newsletter. Thank you so much for your profound comment on Ilonka. Thanks for your Forgiveness comment. Deborah, I enjoyed your comment on my little literary farce. Having fun with "GV" is my way of getting even with dorks like that who trash serious efforts by writers and other artists. Thanks for your recent comments on "What Some Boys Do" Deborah! 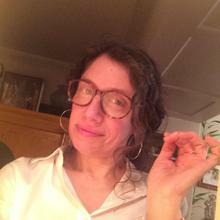 Hi Deborah: I just read your comments on the Forum and I hope navigating this space has become easier for you. Welcome. I loved Mouth Manifesto and your comment on my story Spaghetti Woman. Thank you so very much! Thanks for the read and comment on "Fat Tuesday." NOLA, especially during Carnival, is so lush. deb, a group here called Pure Slush also publishes non-fiction. You must log in to write on Deborah Oster Pannell's wall.